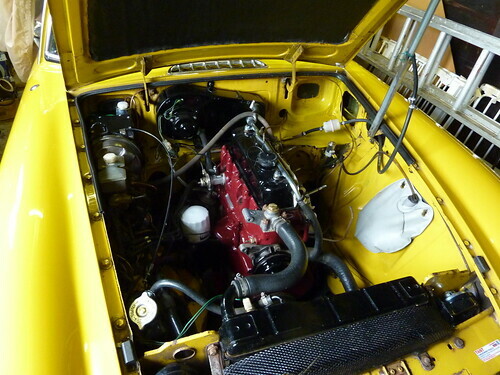 With all the other work we've been doing in the engine bay, the engine block had started to look pretty tatty. First decision was what colour? The 'proper' colour for this production year is black, but I wanted to be able to see the shape of the block and so decided on the more traditional MGB block colour of maroon. This was going to be an in-situ paint job - I didn't have the space or equipment to pull the block out and as long as you are careful you can still get a good finish. First thing was to pull everything off the engine; carbs, alternator, heat-shield and various wiring and cables were all removed. The block itself wasn't in too bad a condition, having oil deposits only in a couple of places under the carbs, so preparation time was cut down. Once everything was masked off (especially making sure the plug and intake holes were guarded), I used the maroon engine paint from Moss which went on really well. It looks a little more red in the photos than in reality, actually being a very nice deep colour. I opted to leave the rocker box the black I'd recently painted it and also made the water pulley and drive wheel black to match. Another part of the engine we decided to paint was the exhaust manifolds. These came up very nicely after some cleaning and after a coat of aluminium heat-proof paint looked just the part.